You can get lost in this 4,932-square-foot home and its rich Blue Grass history in Millersburg, Kentucky. Located on a quarter-acre lot at 1001 Main Street, the two-story gem is filled with 19th century wow factors and current upgrades. A gorgeous wooden staircase winding from the front room is the centerpiece of the single-family home. The Abbott House lives up to the bragging rights of historic Texas. The distinctive three-story Victorian is not only big in size, big in style, and big in history, it’s also big in value. Located on a large corner lot in Hillsboro, Texas – the county seat of Hill County – this 4,612-square-feet landmark home is a classic and comfortable blend of sweeping historic elegance and recent modern upgrades. In addition to three living areas, a formal dining room, and third-floor unfinished attic, interior features range from four bedrooms, 2.5 baths, and a stainless-steel kitchen with gas stove-top and oven to multiple staircases, four decorative fireplaces, and handicap accessibility. If the walls of this timeless 1914 treasure could talk, what name-dropping stories they could tell! Some of the world’s most notable structures are among the works of award-winning New York architect, William Adams Delano, including palatial mansions for the Rockefeller family and Otto Kahn. But Chestnut Court was his personal haven that he designed for himself. Located at 2 Chestnut Court in Muttontown, New York, this 6,100-square-foot stucco Tudor contains two and three levels, eight bedrooms, five-and-a-half baths, and an immaculately-landscaped two-acre estate with a stone patio, wooden deck, and swimming pool. 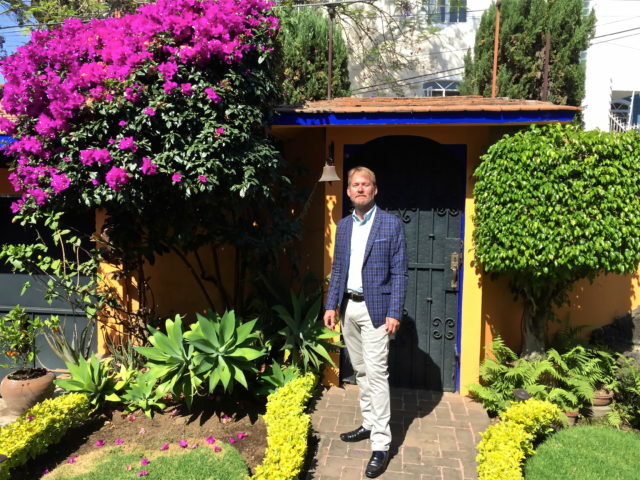 With spring breaking, and wanderlust mounting, an invitation to Cuernavaca, Mexico, seemed the perfect antidote to the winter doldrums to which your sulky Fort Worth Friday correspondent has lately succumbed. As old as Mexico itself, Cuernavaca contains the oldest preserved colonial building in the Americas, the nearly 500-year-old Palacio de Cortés, built atop an earlier, demolished, Aztec structure. Fifty years ago, Cuernavaca was a sleepy little resort town of 35,000. Now at 350,000 souls, Cuernavaca is a big little place, with great shopping, frequent cultural events and even fewer reasons to return to the capital which, on a good day, is a short 45 minutes to the north. There’s an estate in Florida that is as impressive for its physical features as it is for the dignitaries that have visited there — that includes sitting presidents, foreign royalty, and high-profile international guests. We’re not naming any names, but trust us there are good reasons why this house was long ago dubbed the White House of the South. Oceanfront access is one of the most sought-after features in one of the country’s most sought-after neighborhoods and this Sagaponack, New York, home has 250 feet of frontage to the Atlantic Ocean. Current owner Elie Tahari, famous for his mark on New York’s fashion world, has decided he isn’t spending enough time at 135 Crestview Lane in the Hamptons so doesn’t need the peaceful retreat he has owned for the past seven years. The three-bed, three-bath home sits on two-and-a-half acres behind a gated entry and provides a substantial amount of privacy from the rest of the world while being a welcoming space for family and friends to gather. The home’s great room combines all the elements of an open floor plan but lets the view to the outdoors be the main feature of the room. Notice the windows on the righthand side of the picture? They have a matching piece on the other side of the home and both act similar to a garage door that rolls all the way up so you can create a seamless transition to the outdoors. The kitchen is part of the overall great room but is so subtly woven into the living space that it doesn’t dominate the relaxed beach house vibe of the lower level. Adjacent to the living room is a space for more formal dining with enough room for at least a 12-person table. The lower level reveals a few more sophisticated design details that upgrade the luxury aspect of the home. That see-through barrier on the side of the stairway is functional as a safety barrier but acts as a reflective surface to bounce light around the room and create an airy vibe. The balcony helps draw the eye up so the beamed ceiling becomes part of the feel of the room as well. The master bedroom comes with a private oceanfront view and walkout deck. The master bathroom matches the level of luxury seen throughout the rest of the house with stunning marble and a step-down tub/shower set up that almost feels like it could be an outdoor shower. Check out the rest of the photos to see the pool, outdoor dining area, and great views. The 4,500 square foot home is listed by Sotheby’s for $44.9M and also comes with plans for an extension already approved by the zoning board. They were developed by Stelle, LoMont, Rouhani, Architects who were the team behind Calvin Klein’s oceanfront estate. The Oracle of Omaha bought this contemporary Laguna Beach home for just $150,000 in 1971. He’s listing it now for $11 million. Warren Buffett, also known as the Oracle of Omaha, was certainly clairvoyant as far back as the 1970s. Long before he became the largest shareholder of Berkshire Hathaway and one of the wealthiest people in the United States, he bought this six-bed, seven-bath home at 27 Emerald Bay in Laguna Beach, Calif., for $150,000 at his wife’s suggestion. The year was 1971 and the enclave off of Emerald Beach was barely developed. But now the neighborhood has grown to have as many houses that can fit, and they are certainly selling at a much higher price point. Buffett has listed this home for $11 million. Secretary of State Rex Tillerson and wife, Renda, aren’t waiting until they can find a buyer for their waterfront property in Horseshoe Bay Resort before putting down roots in Washington D.C. They bought a D.C. home back in February as a private, off-market sale for approximately $5.6 million. The sellers were none other than former AOL executive Richard Hanlon and his wife, Pam who paid $3.15 million for the home in 2011. But it is their new neighbors that are going to keep things interesting. This leafy and luxurious D.C. neighborhood of Kalorama also has Ivanka Trump and Jared Kushner as the new renters of a home owned by a Chilean billionaire. The Obamas have also purchased a stately home from former spokesman Joe Lockhart, and don’t forget one of the biggest D.C. home sales of all time that went to Amazon founder Jeff Bezos in the same neighborhood.